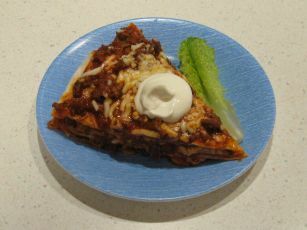 This easy enchilada recipe will have you at the supper table in no time! 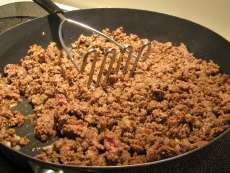 Cook the beef in a pan and break it into small pieces. We have found that a potato masher works really well for that job! Drain off whatever fat may be in the meat. Sprinkle the beef with the onion, chopped garlic, pepper, salt, and chili powder. Add the water and the pizza sauce and simmer for 3-4 minutes. 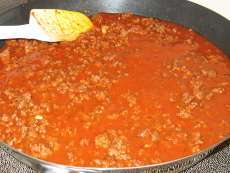 In a round, microwave safe, casserole dish spoon a fifth of the meat sauce onto the bottom. Then place a tortilla shell on top of that. Spoon on another fifth of the sauce and the add a fourth of your cheese. Continue with another tortilla, and keep going with these steps until you end with your cheese as the last layer. 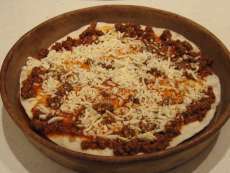 Heat in a microwave on high for about 10-12 minutes, or until the cheese is melted. This is one of our fastest, fun easy recipes for kids. Try it when you are busy and don't feel like spending your whole afternoon in the kitchen!